Do you strive to have a minimalist wardrobe? Could you wear one outfit for an entire year in order to simplify your life? Years ago I read a blog about a girl who did an experiment where she only wore one outfit everyday for a full year. She did not have 5 of the same shirts and pants. She literally wore the same shirt and pair of pants everyday. She chose pieces that did not need to be washed everyday, and although she doesn't say, I am sure she had separate workout clothes and getting dirty in the garden clothes. I would never do this. I was really interesting to read, but it is not something I desire to strive for. However, it was inspiring . It made me reeavlaute my closet and the clothes in it. Daily I am looking in my closet to see if I am holding on to clothes I think I like, but never actually wear. The clothes I keep passing up for some other piece I would rather wear. I am slowly whittling down my closet to the great pieces of clothes that I always like to wear; the ones I always feel good in. This has also inspired my shopping habits. The other day I was returning something at TJ Maxx and decided to stroll through the women's section. As I was looking at shirts, I really scrutinized the look, color, fit and material. I only want to bring clothes into my closet that are quality and loved. 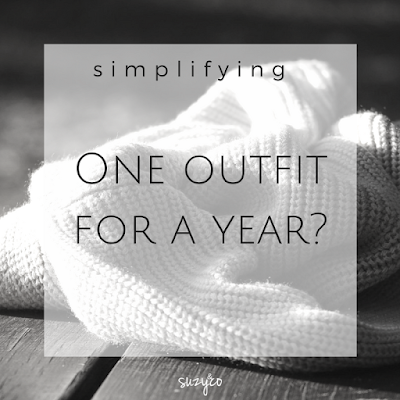 As my simplification journey continues, The idea of less outfits is not so scary and almost refreshing. I like the idea of knowing the pieces I keep are pieces I feel really good in. 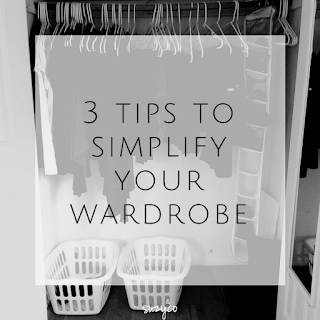 You may not be ready for one outfit, but if you want help to simplify your wardrobe I have 3 tips.